By Chris Williams: 5’10” challenger Chris Algieri (20-0, 8 KOs) says he tried to have the weight for his title shot against WBO welterweight champion Manny Pacquiao (56-5-2, 38 KOs) to be at the full weight of 147 pounds for their November 22nd fight, but he was turned down. Pacquiao’s management wouldn’t agree to fight at the full weight for the welterweight class even though their fighter was the WBO 147lb champion. Instead, the Pacquiao-Algieri fight will take place at a catch-weight of 144 pounds. Pacquiao’s trainer Freddie Roach has said the reason for the catch-weight is because they’re getting Pacquiao down in weight to get him ready for fighting at 140. However, that doesn’t make a whole lot of sense, given that he can easily make weight 140 pound weight without any problems without needing to have a fight at 144 beforehand. A more likely explanation for having the bigger Algieri agree to fight at a catch-weight of 144 pounds instead of the full weight for the welterweight division is due to Algieri’s size. He’s a big fighter and he would be even bigger and tougher for Pacquiao to beat if he were able to fight at 147 instead of 144. 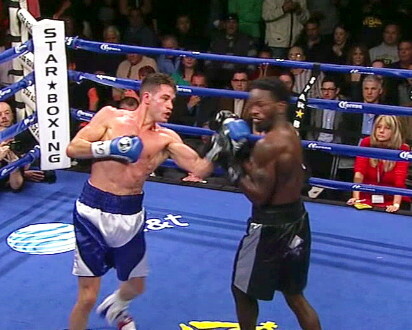 Algieri fights at light welterweight, but he’d be even better if he could fight at 147. I think they chose not to let Algieri fight at 147 because of his size. He would have an advantage over Pacquiao if the fight were to take place at the full weight for the class. Sure, Pacquiao previously fought some tall fighters in Antonio Margarito and Oscar De La Hoya, but both of those guys had to come down in weight to fight Pacquiao. De La Hoya had to drain down from 154 to fight Pacquiao at 147, and Margarito had to drain down to 150. Algieri isn’t a shot fighter and he would be very difficult for Pacquiao if the fight were to take place at 147. That’s why I think they’re asking for a catch-weight of 144 for this fight instead of letting it go ahead at 147.